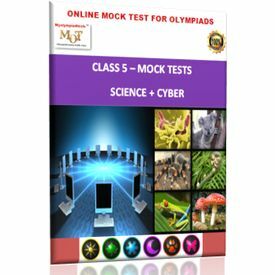 MOT is a leading Online platform for Olympiad preparation. This Combo comprises the following: Science In this online test series, topic wise tests (30 questions each) will be there for the following: 1. Plants - Part 1 2. Plants - Part 2 3. Animals 4. Materials 5. Water 6. Matter 7. Human body & Diseases 8. Earth & Universe 9. Conservation of natural resources 10. Force & Friction 11. Work & Energy 12. Machines Cyber: In this Online test series, there will be 30 questions in each of the following topics: 1. Class 4 - Software 2. Class 4 - Part of computers 3. Class 4 - MS Paint 4. Class 4 - Input - Output devices 5. Class 4 - Hardware 6. Class 4 - Fundamentals of computers 7. Class 4 - Evolution of computers 8. Class 4 - MS Word 9. Class 4 - Computer networks 10. Class 4 - Internet 11. Class 4 - Using windows 12. Storage You can attempt each test upto 3 times. The duration of each test is 1 hour. You will get instant results and explanations. Please note that all our tests are online and you will need a computer and internet access. We neither provide printed material nor there is an option to download or take a printout.